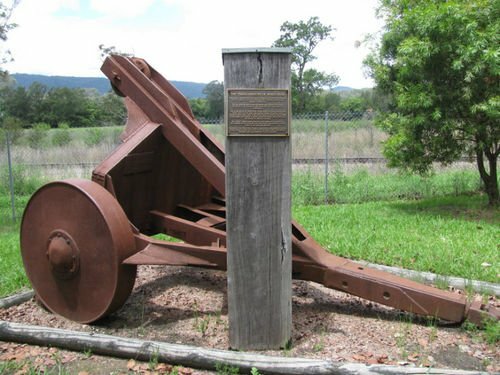 The monument commemorates all those who were associated with the timber industry of Wards River which operated for seventy-five years. This plaque commemorates the owners, managers, mill workers, bush men, and their families of the once thriving timber industry centred on the village of Wards River. The saw mills included Turner & Ebbeck; G & D Mackay ; A J Fenning ; E D Pike & Co ; R J White & Co ; W D Wood ; Yates Bros and numerous contractors. This is the site of the Wards River railway yard from where much of the timber sawn at these mills, plus railways sleepers & girders cut by broad-axe, piles, posts & pit timber, all drawn from the surrounding forests began their journey to points around the nation and to Newcastle and Sydney for shipment overseas. The "dobby" parked nearby was one of the earliest of many built by A B Campbell & Sons Gloucester and used to haul logs behind a crawler tractor in the bush and mill yard. Presented to the Wards River Progress Association by the family of the late George Mackay to mark the closure on 26 November 1999 of G & D Mackay Sawmillers after approximately 75 years operation.